ike him or hate him, golf pro Tiger Woods is a winner. He proved it again on Mother's Day Sunday when he held off the competition and won The Players Championship at the TPC at Sawgrass in Ponte Vedra Beach, Florida. It marked his fourth win in only seven tournament tries of the young season . His secret for winning? 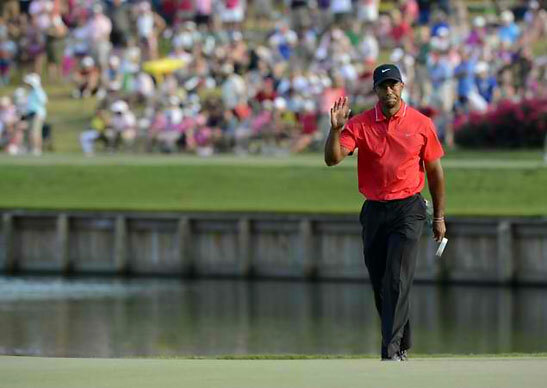 Along with owning a great golf swing, being a master strategist and having a history of pretty much being in the hunt on any given Sunday, it's got to be that RED shirt he dons whenever he marches to the first tee on the final day of tournament play. 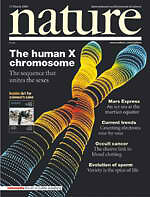 And, I've got scientific proof to back that up. According to researches, the color RED can be intimidating. In a 2005 study by British scientists, published in nature, the international weekly journal of science, they found that athletes wearing RED have an advantage over competitors wearing other colors. "We find that wearing RED is consistently associated with a higher probability of winning," the researchers wrote. Now, this isn't a post about Tiger, or golf, or athletics. It's about... grocery shopping. Wearing BLUE as I entered the supermarket  I'm already at a disadvantage  I immediately stopped dead in my tracks and stared straight ahead into the produce section that fronts the store, much like those Pete Dye-designed pot bunkers guarding the greens at Sawgrass. 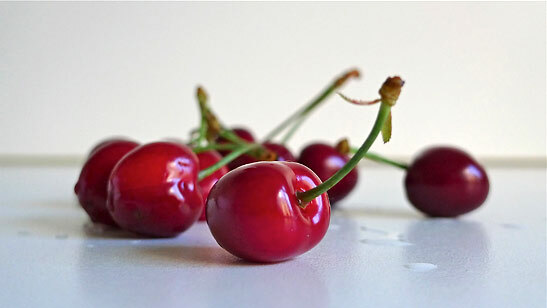 Right there, bookended by YELLOW bananas and seedless GREEN grapes, were plastic containers filled with shiny, bright RED cherries. Like Tiger when he makes the turn and starts his charge on the final back nine, those ciliegie Bigarreaux (Bigarreux cherries) dared me to try and come close to their pin placement. With hazards on both sides  the aforementioned bananas and grapes  I felt like tearing up my shopping list (scorecard) and just calling it a day. Inspecting several cartons, I found nary a bruise or blemish (divot or spike mark); so, zombie-eyed as I was  like Bill Murray handling explosives to get at that menacing gopher in Caddy Shack  I picked one out, placed it in my hand-carry cart, came to my senses and walked away salivating at the mouth knowing what awaited me when I got to the 19th hole: the BLOOD-RED sweetness that'll be drawn from the very first bite  like the motionless thud that the "Man-in-RED's" Titleist Pro V-1x golf ball makes when landing firmly on the green. 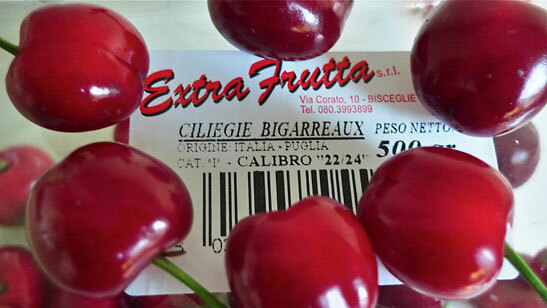 The Bigarreux, grown down south in the Puglia region around Bari, is the very first variety to hit stores and open-air markets around Italy. 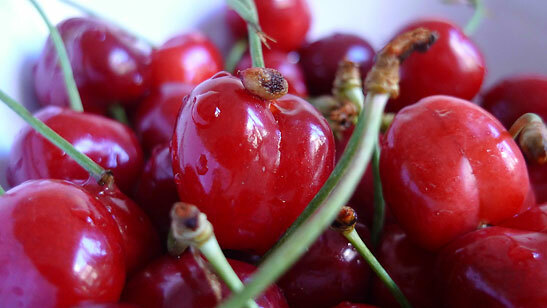 Because these cherries officially open up the season in the Bel Paese  similar to Palmer, Nicklaus or Player (the "Man in BLACK") at The Masters  they get added celebrity as the prima primizia (first fruit). On sale from early May to June, the B'reux is heart-shaped with firm and crunchy flesh, and a mouth-watering sweet taste. They don't have much of a shelf life, so they're rushed to markets across la Penisola within 48-72 hours of harvesting, and then quickly and continuously consumed by countless Italians until the short season is over. Those "mad" scientists do say that RED, more than any other color, provokes clearly identifiable reactions in human beings. I guess they're right. 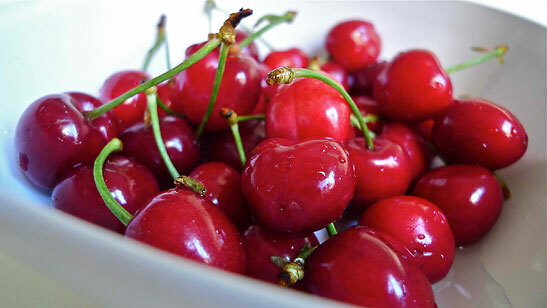 I'll tell you one thing, I won't be grocery shopping on Sundays until the cherry season is over. Like Tiger Woods and that island green on the 17th at Sawgrass, they're just too INTIMIDATING.